William Donovan, "The Last Hero"
Note: For those who are interested in learning more about ‘Wild Bill Donovan’, Fr. Duffy and the 165th in World War I, the Division donated a book “Duffy’s War” to the Pearl River Library which is an excellent source on the topic. 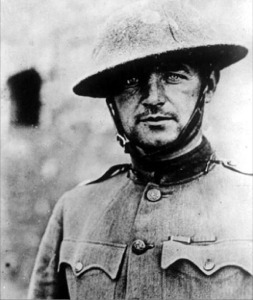 William Donovan is the only American to have received our nation’s four highest awards, The Medal of Honor, the Distinguished Service Cross, the Distinguished Service Medal and the National Security Medal. The Chaplain of the 165th, Father Francis Duffy is the most decorated Chaplain in the history of the United States Army. Rockland has a special connection to the 165th and World War I, Irish American Sgt. Michael A. Donaldson, a native of Haverstraw, was awarded the Medal of Honor for in one battle making six trips into “no man’s land”, exposing himself to machine gun fire to bring back wounded comrades. Many years prior to WW I, Father Duffy said his first mass as a newly ordained priest at St. Peter’s in Haverstraw where he served till taking a teaching position at Dunwoodie. The altar boy who assisted Fr. Duffy while at St. Peter’s was a very young Michael Donaldson. Though consider the “Father of U.S. Intelligence” and founder of the O.S.S, William Donovan was inexplicably passed over when it came time to create its successor organization, the CIA. Some part of this decision was clearly motivated by interdepartmental rivalry, particularly J. Edgar Hoover of the FBI. Others think an explanation may trace back to Donovan’s days with the 165th when Donovan made a blistering phone call to headquarters complaining about U.S. artillery support falling short and hitting his troops. There is circumstantial evidence that the commanding officer of the battery that day was a captain from Missouri, Harry S. Truman.